Born in Mozambique, the international model has been fighting for 10 years to save children from AIDS. Now, in Malawi a personal dream has become a reality, with the construction of a maternity clinic to combat one of the highest rates of maternal mortality in the world. For each single woman who dies during or after labor in Europe, 190 will die here. This is an atrocious reality that she wanted to capture in a group picture: the only white woman among a group of black women: women who sufferings are matched only by their smiles. Tasha has already raised 300,000 Euros to build and run her maternity unit for the next 3 years. She now has to raise an additional 60,000 Euros each year. Where the drug Nevirapine is administered to HIV positive women, the infection rate for newborn babies drops from one in three to one in eighteen.. In 2005 the president of Mozambique gave her the courage to use her glamour for this ‘enterprise of the heart’ and to serve this worthy cause. “Our daughter has come home” were his words as he welcomed her. 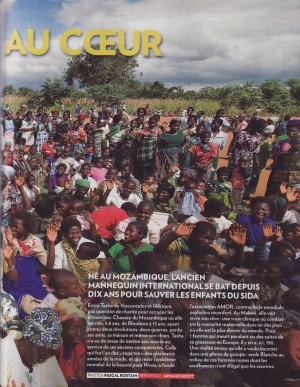 Prince Albert II of Monaco supports AMOR: Louis Vuitton the Malawi maternity project. “Beauty is a gift I was given to help me accomplish what I was made for”, she says. The maternity unit’s firstborn baby girl will be called Tasha. When she was a child, she had a mongoose as a pet. She still remembers the names – Isabelle, Francisco, Simon, Pedro – of the people she grew up amongst, their children her playmates, in Beira, in Mozambique on the shores of the Indian Ocean. The house may have changed but the land is the same. It is all that matters, she says. A land bathed by the waves of the ocean in which she learnt to fish. She tells of her childhood in this paradise, this wild and beautiful environment, touched by the hand of God. So when she sees American stars arriving in their private jets rushing to carry off an orphan from a supposed hell, she trembles with indignation. “These children have families, sisters, brothers, grandmothers. Above all they have a country!” It is the soil of this land that she carried away on the soles of her shoes at the beginning of a civil war that killed one million people. She was just 8, and there was no time to waste. Only women and children of whites were allowed to leave. Her father, a businessman, had to leave in the middle of the night, by car, with the help of his African friends. They headed for Rhodesia. A bad choice. But we don’t choose our own destiny. The Rhodesian connection was on her mother’s side. Her grandfather owned a large farm producing corn, tobacco, and cotton. One day in 1976, guerillas shot him at point blank range. She vividly remembers her mother hearing the news by ‘phone and passing out on the floor. Another civil war was about to start, that would last 8 years and turn the bread-basket of Africa into a desert, ravaged by cholera. The Vasconcelos family had already left Africa., where their two daughters could not ride their bicycles to school anymore. By the end, they could not even leave their property. These are nightmares that could have made her bitter but they inspired her to help these people, African villagers, who are, she says, the kindest people in the world. When she was 18, fame struck. This is the road, she explains, that providence chose for her to make a difference. She is beautiful, especially her illuminating smile. She graced the cover of Italian Vogue. Paris, Rome, New York…she became one of the ten most high-profile models: nomads of luxury and beauty, whose furniture are their suitcases. Fittingly she is now sponsored by Louis Vuitton. Tasha lives on a different planet, immune to jet lag or changes of environment, and at ease with billionaires and the poor alike. “If I didn’t mix with the rich, how could I help the poor?” she points out. And they succumb to her charms. When she says “You can help me”, who can resist her? father is dead but she is sure he would have loved the young woman she became, a warrior whose weapons are beauty and the force of her convictions. Her humanitarian journey began in 1996. That year, she carried out her first mission for the Nelson Mandela Foundation. She knew South Africa from childhood holidays and remembers the bathrooms that were not to be used by black people. It was her first memory of injustice. Subsequently she worked for UNICEF and UNESCO, but it took her 10 years to figure out what she really wanted to do – to tackle a project unique to her that she could carry through to completion . A little bit Mother Theresa, a little bit entrepreneur, she had to wait, trusting time, knowing that she couldn’t build on sand. To venture into the jungle of African she had to find a reliable partner. She finally found him in Dr. Christopher Brooks, a 70 year old Englishman. They are cut from the same cloth. He had planned to enjoy his retirement in Canada, but chose to give up an easy life- skiing, sailing, playing bridge to give back to others. He trained in tropical medicine in Liverpool and flew out to Malawi with his wife Heather and their daughter Chloe. At the beginning he worked from the back of a truck, treating patients and dispensing medication., helped by a nurse and a translator. Then some Canadian friends joined them, and they founded Lifeline, an organization that now employs 62 people, treats 18,000 patients a month, and has opened two clinics, one in the center and one in the north of the country. Dr Brooks and his friend Pat Laforet are the only two white men (‘Azungu’ in the local language). People in Africa are not surprised by their sacrifice. It is the norm. But they share a common joy. “It’s a feeling that just rises up when we do what we have to do” explains Tasha. Christopher Brooks is a very practical man, not given to theories about the world and its miseries. He simply explained to Tasha that in Malawi 14% of the population is HIV positive. His aim was to reduce the transmission of the virus from mothers to newborn babies. And he wanted to tackle maternal mortality. AIDS and labor complications together have created one million orphans who will never know the life of a Hollywood star. He sent her his plans for a small maternity clinic that women can walk to - or travel to by ox cart. Few of them , nearing full term, are able to walk the 20 kilometers to the closest local hospital. If everything goes well, they will only spend just one day there. However one wing is dedicated to those with complications. 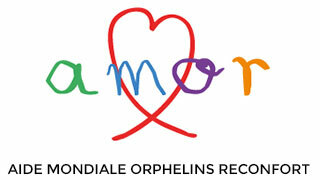 It is scheduled to be opened on November 10 by Prince Albert II of Monaco. 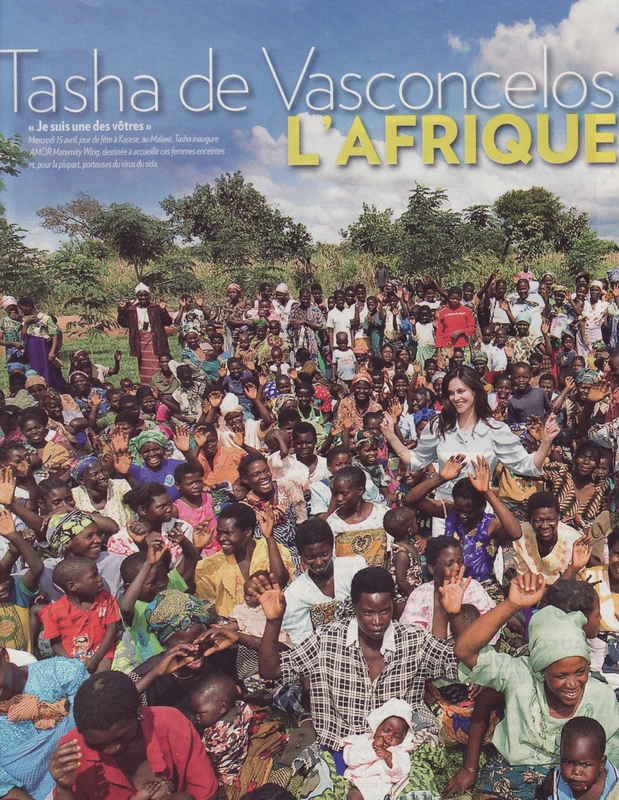 In January 2008, Tasha made the first transfer of funds. She was promised that the clinic would be built in one year. She opened it after just a three month delay: a great achievement. The first girl who will be born there will be named Tasha., the first boy George, after George C Mkondiwa, the Provincal Governor. For the women in the unit, as Tasha carries their crying children, she is a princess who they look up to and whose hair they love to stroke. The governor is more critical: “Eat,” he tells her. “Here you will never find a husband. …Tasha breaks into laughter. “If I listen to you, I’ll get no more contracts…!” Don’t eat too much Tasha: you need to raise 60,000 Euros a year to keep your clinic alive. Return to the former Rhodesia: in June 1998, in a Bulawayo school, Tasha played the games, and saw the uniforms of her own schooldays. Princess of the heart – in April 2009 Tasha sits African-style among the sick who wait help from the mobile clinic sent from her maternity unit one hour away. Tasha at Violet School in Ngodzi. The school is named after one of the nurses from the AMOR clinic, who in memory of her son who died from AIDS teaches 30 orphans each day. “Beauty in natural” – as photographed in Deauville in 1997 by Peter Lindbergh, wearing ‘teddy bear’ coat.